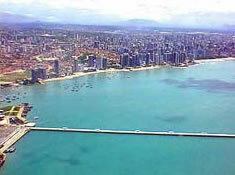 The city's name, meaning "fortress," is the only visible legacy in modern Fortaleza of its earlier eventful history. Prosperity came to the city in the 19th century when ranching was rapidly expanding and Fortaleza became a major port for the hinterland. For decades, the most important export, however, was labor; during drought years working men and their families were transported from here in huge numbers to the rubber plantation zones of the Amazon and to expanding industrial cities in southern Brazil. Today a sprawling city of almost two million inhabitants, Fortaleza is the capital of the State of Ceará and one of the chief commercial centers of Brazil's northeast region. Despite its size, the city's layout is easy to grasp; the center is built in blocks that form the commercial, administrative and religious heart. A French architect designed the original street pattern in the 19th century, contracted by the ambitious city fathers that hoped to turn Fortaleza into "The Paris of the North." More recently, the city has made attempts to expand the tourist trade and encourage the construction of luxury hotels along the city's fine beaches.